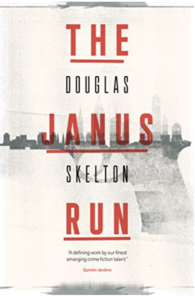 Delighted and excited to be taking part in sharing the #booklove for Douglas Skelton’s THE JANUS RUN today. Huge thanks to the author and Sara Hunt of Saraband/Contraband books for the ARC. 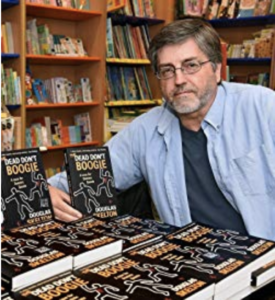 Find out a little more about Douglas Skelton and the book below – then read on and see what I thought of this New York City, gritty and action packed read! Douglas Skelton has published 11 books on true crime and history. He has been a bank clerk, tax officer, shelf stacker, meat porter, taxi driver (for two days), wine waiter (for two hours), reporter, investigator and editor. His first thriller BLOOD CITY was published by Luath Press in 2013. The gritty thriller was the first in a quartet set on the tough streets of Glasgow from 1980 onwards. It was followed by CROW BAIT, DEVIL’S KNOCK and finally OPEN WOUNDS, which was longlisted for the first McIlvanney Prize for Scottish Crime Book of the Year. The first Dominic Queste thriller, THE DEAD DON’T BOOGIE, is now available from Contraband. The second, TAG – YOU’RE DEAD, was published in April 2017. Keep your eyes peeled for THUNDER BAY from Polygon in 2019. Desperate to uncover the truth and clear his name, Coleman hits the streets. But there’s a deranged Italian hitman, an intuitive cop, two US Marshals, and his ex-wife all on his tail. And trying to piece together Gina’s murky past without dredging up his own seems impossible. Worse, the closer he gets to Gina’s killer, the harder it is to evade the clutches of the mysterious organisation known only as Janus – from which he’d long since believed himself free. Packed with plot twists, suspense and an explosive climax, The Janus Run is an edge-of-the-seat, breathtaking thriller – NYC noir at its finest. Eeeeeeek! Set in New York, the reader is engrossed in a story of loss, corruption, power, mistrust, terrorism/the mafia, secrets, the past, payback, a search for the truth and so much more! WOWSERS! I absolutely love this type of novel! The kind that immediately has your heart racing, blood pumping and your brain questioning everything after each turn of the page! A thrilling and intriguing plot, great narrative and strong characters have made this a new series I will be following closely – it HAS to be a series! Cole Lang is a fascinating character – trained to kill, he left a secret agency (Janus) in the hopes of living a normal life…but then his world falls apart and he is caught up in a search for the truth with some of the most unlikely allies! I am a huge fan of Douglas Skelton and can’t find the words to describe each of the OMG-moments that just put a massive grin on my face – a book that has all the elements to make you want to shout from the rooftops, has you believing what is happening on the pages could be real, and excites you to the very core of your being. Such a talented and accomplished writer, I have never been disappointed with a novel from Mr Skelton! Would I recommend this book? OMFG – that is a mahoosive HELL YEAH! Gritty, raw, edge-of-your-seat thrills will have you desperate for more of this fantastic new series! Grab your copy today! 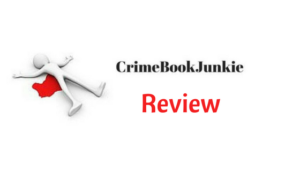 This entry was posted in Book Reviews and tagged #ActionPacked, #Crime, #Crime #Twists #Murder, #CrimeFiction, #CrimeThriller, #Gritty, #Murder, #Suspense, #Thriller by crimebookjunkie. Bookmark the permalink.